If there’s one theme that has dominated discussions in Davos so far, it’s inequality. At the start of the week, Oxfam released its annual report about the growing divide: this year, just eight men own the same wealth as half the world. It’s hard to say we didn’t see it coming: as far back as 2009, researchers were already drawing attention to the link between inequality and a whole host of other ills. And according to Christine Lagarde, she also attempted to ring the alarm bells – to no avail. “Madame Lagarde, you came here to Davos in 2013, and you talked about inequality. At the time you didn’t get much traction,” Francine Lacqua asked the IMF chief in a session on the second day of the Annual Meeting. “I don’t know why people didn’t listen, but certainly I got a strong backlash, in particular from economists saying that it was not really any of their business to worry about these things,” she replied. At the time she said that a whole host of IMF research indicated that unequal growth could never be sustainable. Earlier this week the latest IMF World Economic Outlook reached the same conclusions. 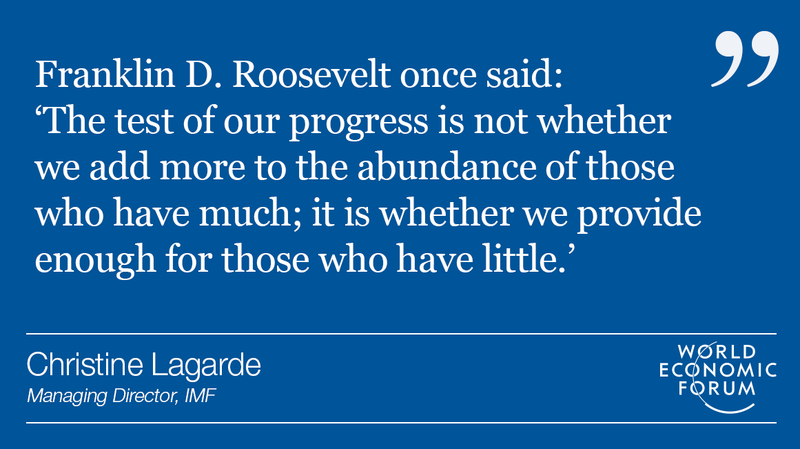 Addressing world leaders in Davos four years ago, Lagarde quoted Franklin D. Roosevelt to warn them of the dangers of rising unequality.